I’ve carved pumpkins every Halloween with my children for years. Confession – I really hate it. 1. The pumpkin guts sting my hands. 2. It’s hard to scrape and clean it out. 3. It makes a big gloopy mess without a lot of fun. This year I decided to break with tradition and not carve pumpkins. 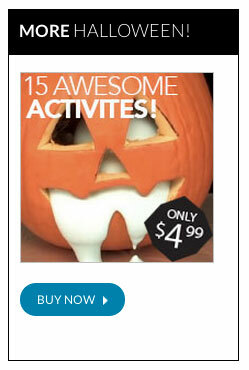 So I began looking for crafty ideas that included a little science and a void of pumpkin innards. Look closely to see the dark blue glow in the eyes – the invisible pen creates this effect. I ended up adding a Magnetic Paint with a little Zinc Sulfide and a lot of creativity. Lay newspaper or cardboard to protect surface. Wipe dirt or dust off pumpkin so paint will stick. 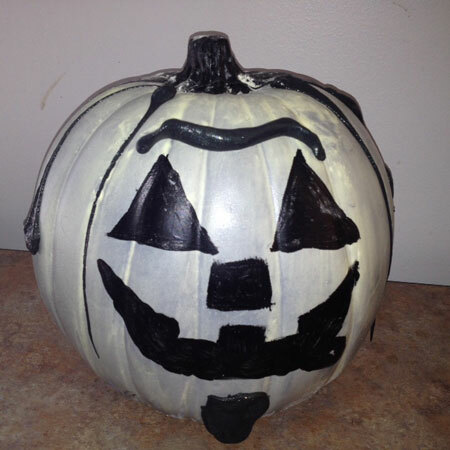 Cover pumpkin with magnetic paint. This may take several coats to build up the magnetism. Test with a magnet when dry. Add layers of magnetic paint until magnets hold on the sides. We decided to paint one half of the pumpkin. On the backside, we painted over the magnetic paint with black acrylic chalkboard paint. Before the paint was dry, we lightly sprinkled some glow powder for a special effect. The blue glowing letters are written in Invisible Pen. They only show up under a Black Light. Draw the face pieces on the contact paper and cut each piece out. 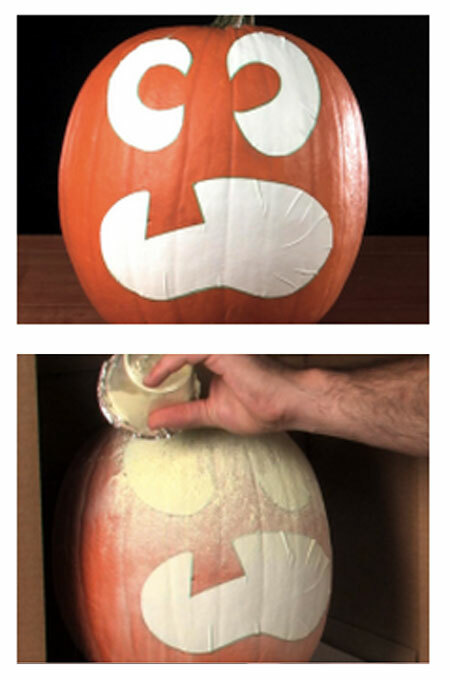 Peel the pieces off the paper backing and arrange them as a face for your pumpkin. Once your jack-o-lantern face is complete, take your pumpkin outside and place it on the drop cloth. Spray sections of the pumpkin with the spray adhesive, immediately following with the Glow Powder. For best results, hold the adhesive 10-14 cm (4-6 in) away from the pumpkin and spray a heavy coat. When sprinkling the powder, you may also want to tilt your pumpkin to get it evenly covered. Pour the Glow Powder from its jar into an empty salt shaker. This will make it much easier to sprinkle the powder onto your pumpkin. Alternately, you can pour the Glow Powder into an empty portion cup. Cover the top of he portion cup with aluminum foil and hold it in place with a rubber band. Use a thump tack to poke holes in the tin foil… just like a salt shaker! Continue spraying and powdering each section of the pumpkin until the entire pumpkin is completely covered with powder. Carefully shake off any excess powder as you go. 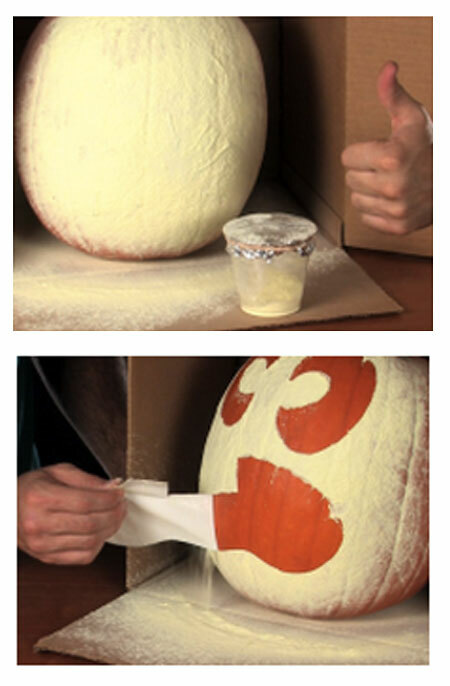 Repeat steps four and five to ensure that your pumpkin is evenly and completely covered with powder. 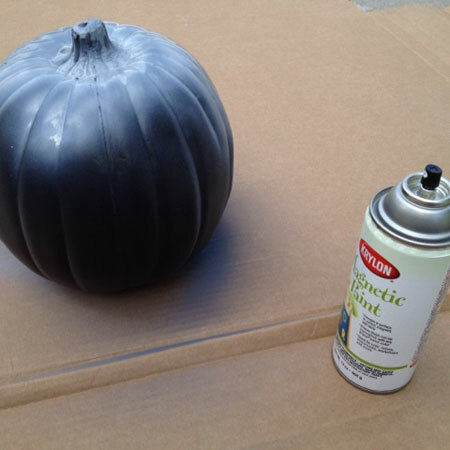 After the adhesive is completely dry, spray the entire pumpkin with the sealant to make sure that the Glow Powder stays affixed to the pumpkin. After the pumpkin is dry, carefully pull the contact paper off of the pumpkin. Using the Invisible Ink Pen, write a secret message on the non-face side. If you used chalkboard paint, you can also decorate with colored chalk. Using the Magnetic Putty, we changed up the look by adding a uni-brow, a goatee and stringy hair. 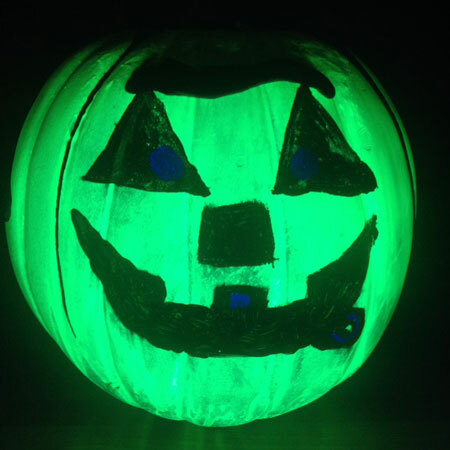 For the final act, place the pumpkin next to a black light to read your secret messages and see a different side of your jack-0-lantern. Glow Powder works by absorbing surrounding light energy and then releasing that energy when the lights go out. It’s called a phosphorescent powder. 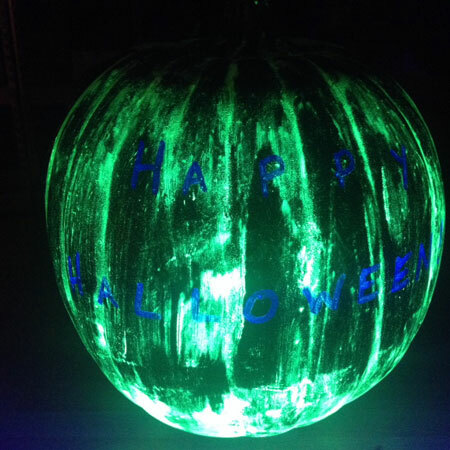 It’s the perfect way to get your students excited about energy… and a great way to celebrate Halloween! Just add glow powder to almost any of our favorite products and you’ll have an eerie new take on your favorite experiments! Thanks to Smashed Peas and Carrots for the original idea.